As an experiment I combined the Gherkin PCB with a snap off bottom piece. 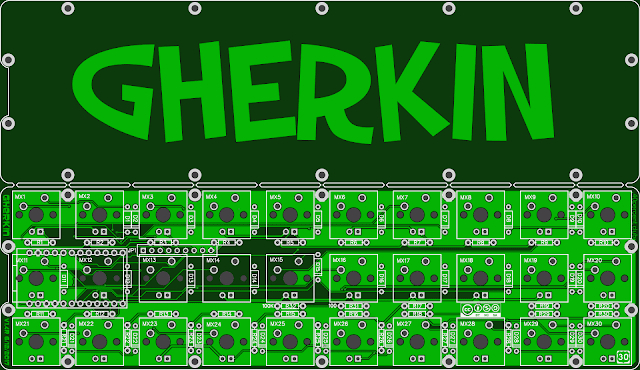 This is the top and bottom plate for a PCB mount Gherkin in a single PCB. I had a few made and they work fine. You snap the board in half and sand the nubs off each side. I use 220grit wet/dry sandpaper and wet sanded it with the paper on a flat surface. I sanded all four sides so they had an even smooth finish on all edges. The boards are fiberglass so wet sanding will keep you from breathing in dust. While this worked, it actually cost more than just using a second PCB as the bottom. EasyEDA prices by area, and the two parts with the little gap between are more than twice the size of the PCB alone. Also the volume price breaks work against this. 5 combo pieces are $16.09 and 10 regular PCB's (using one for top and one for the bottom) are $15.93. There is also the additional labor of sanding down the parts. It is better to just use two regular PCBs. The gerber preview of the combo PCB. The combo PCB as it comes from EasyEDA. Both parts attached by little nubs. The PCB parts separated and edges sanded smooth. Assembled with Gateron blue PCB mount switches and blue LEDs inside the switches.